Animal Wildlife | Skunk | The skunk (also known as the polecat) are most commonly known for their ability to secrete a foul,strong smelling odor from their rear end,when the skunk feels that it is under threat.There are 11 known species of skunk in the world,with most of these skunk species inhabiting the American continent.Two of these skunk species are found in Indonesia and the Philippines.The colour of the skunk can vary from the typical black and white to grey,cream and even brown.However all skunks are striped and baby skunks are even born with their striped markings regardless of their colour. The average skunk is between 40 and 70cm in height and weighs about the same as a domestic cat. The skunk hunts insects, small birds and mammals. Skunks also commonly eat berries, roots, grasses and fungi in order to supplement their diet. Baby skunks are born completely toothless and blind, with the eyes of the baby skunk not opening until the skunk is a few weeks old. The baby skunks are also unable to use their defensive spray when they are first born. The skunks spraying ability develops just before it's eyes open when the skunk is a couple of weeks old. Skunks are generally solitary animals and only really come together to breed. 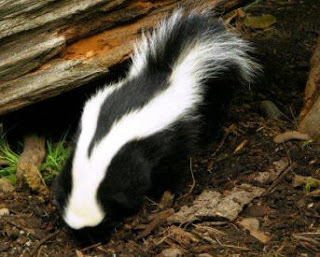 In colder regions however, skunks have been known to inhabit communal burrows in order to try to keep each other warm. 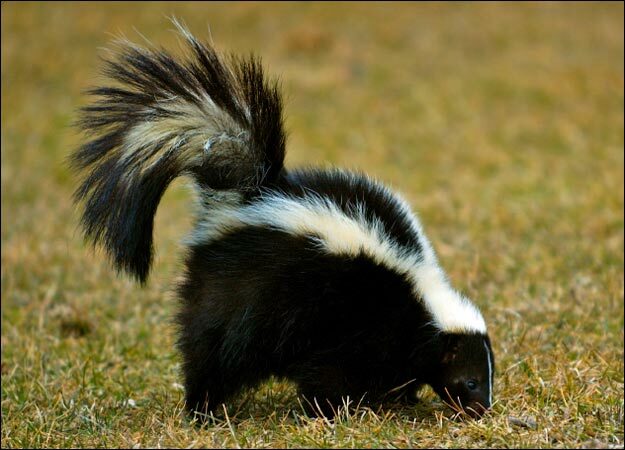 Most skunks hide in burrows during the day which the skunk digs out with it's long front claws. 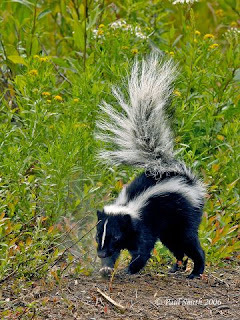 Although skunks have excellent smell and hearing, skunks are known to have very poor vision and can only see objects that are right in front of them. With the introduction of cars, numerous skunks have been killed on the roads as the skunks cannot see the cars coming towards them until it is too late. It's nice to find a site you can trust.Visit Critterriddertexas.com this site was recommended by a friend so I tried it.They provide a Rodent Control Austin, Rodent Control Austin, Bee Removal Austin and Wildlife Removal Austin at affordable price.